Reflections and Ruminations: Loving till it hurts - an arrival or departure point? Loving till it hurts - an arrival or departure point? In a by-now famed quote, Blessed Teresa of Calcutta said that in our Christian living, we are not just called to love, but to love till it hurts. On the mere level of language alone, this quote seems to be something akin to masochism, self-loathing and even craziness. But then, so do many other quotes when taken out of context. What is the context of Blessed Teresa? Undoubtedly, it is the context of the love of God, where we not only demonstrate our love of God, but also become channels of the love of God to a world that is aching, longing and hungering for his love. Oftentimes, we will readily see that loving those who are easy to love isn’t much of an issue. These people are those whom we are already probably comfortable with in life, or what I would call our ‘pew sharers’ – the folk who we share the Church pews with each Sunday. These could be, but are not limited to our spouses, our children and our fellow Christian families to whom we exchange that sign of peace with before we sing or say the Agnus Dei or Lamb of God at Mass. Doing this is indeed good and even necessary, but it is in the Church’s mind that this action is something that is carried outside of the pews, where we become the vulnerable lamb at challenging places. These are the streets and junctions of our lives where signs of Christ’s peace and love are as endangered as the giant panda or the snow leopard. If we really and truly understand the etymology of the word “Mass”, we will see its great importance. Shortened from the Latin “missa” it means dismissal or the state of being sent. Realizing this, just ‘attending’ Mass does nothing to encourage our being Eucharistic once we step outside of safe confines of a prayer hall’s concrete walls. If at all, the ‘attendance’ becomes a necessary empowerment that enables us to be ‘sent’ out to the mission fields of the often agnostic and atheistic world like our neighbourhoods, our work places, where we enjoy our meals and where we recreate and recharge. It is most likely that it is in these ‘pagan’ areas of our lives that true loving which comes from a formed decision to love becomes so difficult and challenging. Oftentimes, even pondering whether or not to bring up the name of Christ or sharing how our faith affects our daily lives in a positive way makes us feel awkward and edgy. But being real about it is what requires a certain element of prudence, where we have a sense that the person whom we are with has a certain softened foundation in the heart that is not hardened and cold, but has instead a softness that is open to having some seed sown in the form of a direct sharing of Christ’s saving truths. This, I believe, takes prudence that comes with practice and prayer. It will always be challenging, but a decision to love is what makes the essential difference. Decisions to love are sometimes the more painful thing to do because it stretches us beyond what we are comfortable with. I think this is the essence of what Blessed Teresa meant when she tells us to love till it hurts. When we are willing to undergo an embarrassment, perhaps being misjudged for our good intentions, when we are far more interested Christ touches the person we are present to as compared to how we look or sound, it will always be painful in some way. But the decision to still continue loving is when that hurt becomes holy because it is no longer about us. We have displaced ourselves in that situation and placed the other person centrally in our midst. I would venture to add something to Blessed Teresa’s famous axiom of love. Love till it hurts, but do not stop loving when it hurts. Because that is when it truly counts. Our human instinct is to stop when things are hurting, and for the most part, it is a good instinct. This is why we have pain receptors in our bodies. It protects us from causing injuries to ourselves, and it helps to preserve our lives. In a blog quite a few years back, I recall reflecting on how persons born with the condition of Hereditary Sensory and Autonomic Neuropathy (HSAN) are a danger unto themselves simply because they lack the ability to feel any sensation of pain. They are totally insensitive to any bruises and cuts that they suffer, even if the wounds become infected. They bite their tongues and can end up scratching out their eyes simply because they cannot feel pain. Yet the very notion of being impervious to pain seems to be a boon rather than bane. But the reality is that the ability to feel pain is in fact something good and beneficial for us. 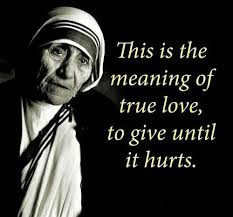 Blessed Teresa’s call to love till it hurts, and my addendum to it to continue to love when it does hurt is thus counter intuitive. Yet, we know that it is when love is not a reaction to love received, but rather when it is a decision made in the face of it being either rejected or unacknowledged or appreciated that it comes close to being redemptive - resembling the saving love of Calvary’s cross where Jesus, the Lamb of God was slain and a divine choice to love was made despite not receiving love in return. That God goes beyond the pain and chooses to love despite the pain makes this decision to love truly redemptive and salvific at the same time. Apparently, even sporting legend and boxing heavyweight Mohamed Ali held similar views, albeit applying it to his punishing exercise regiment. When a sports reporter asked Mohammed Ali how many sit-ups he did when he trained, his response is as legendary as the man himself. He said: “I don’t count my sit-ups. I just do it repeatedly until it begins to hurt. That is when I start counting, because when it hurts is when it really counts”. Loving till it hurts brings the pain. But loving after it hurts makes it count too. Oftentimes it is those within one’s own family that are the hardest to love; in fact I would venture, it is most times. For it is all too easy to ‘get along well’ with those with whom we interact sporadically. Oh, how ‘nice’ we are to them! But when we have to deal with those closest to us on a daily basis, it can be a real challenge. This is because those who are further from us have never hurt us, and therefore, easier to love (or at least be nice to). Surely, one is always hurt most deeply by those one trusts the most. Yet this is precisely what we are called to do. Again and again. And what about our own children as well? Do we just look the other way when they stray? (Lest we, in correcting them, offend them or earn their displeasure?). Or do we ‘stand with Christ’ and do the (tough) loving thing? Loving those difficult to love is hard, and it is a real struggle for me (and I’m sure, for many others as well). During the service of Good Friday 2005 (I think), you preached of Love being illogical (the Black Plague)... The boys are now 18, 16, 14 and 10. It has been very challenging to be a good parent; to provide financial, emotional, moral, educational and spiritual needs to the boys. As much as I know that I am very blessed, in the past year, there were many times, I looked forward to them leaving home. Then in mid August, the Lord presented us with a gift - a huge educational grant. Thus, John left for early college in Massachusetts. My heart hurt so much and it still does. I believe He was giving me an insight to "Love". Yesterday was the second day of school. I kissed Michael goodbye and he hopped out of the car. As I drove away, a feeling overcame me. He's the last one, oh Michael, don't grow up quickly. Then almost like an epiphany, I appreciated all the painful moments motherhood had dealt me. I actually thanked the Lord for giving me 4 boys. There have been so many trying and painful moments... Then your words came to my mind, "Love is Illogical". Yes, indeed, I suddenly didn't understand myself. It's been so difficult taking care of them and I don't know what lies ahead, but "Thank you Lord, for the boys and... 4 isn't too many". God Bless you always, Father, for guiding us. There are times when one tends to stop loving others when love inconveniences one, when demands are made and love may cost more than what one intended to give in the first place and especially when love is not reciprocated. However, the Catechism of the Catholic Church has this to say about love (1766) –“To love is to will the good of another” - this implies that as Christians, we are called to be radical in our love for others - which seemed to be so counter-cultural- for if we were to fulfil this, we would have to forget self, to be selfless - so as to will the good of the other person. In other words – we would have to let go of our own expectations of the other, our disappointments with them ....or in the current favourite phrase, “we have to die to self....” And any form of dying is sure going to hurt. Perhaps, that’s why true loving hurts – but is it an arrival or departure point? – a most intriguing thought! I believe it can be both. When loving makes one vulnerable and hurts bad but (like you said) one continues loving........one may arrive at a plane of acceptance not only of the other as other (a person to be loved in his/her own right – warts and all) but also one’s acceptance of one’s own self as a new emotionally/spiritually matured person, now unencumbered by one’s old fears and hurts – for these have dissipated in the process of loving and hurting! One therefore has arrived at a new level to start afresh. I seem to catch a glimpse of what Prophet Micah meant when he said to “love tenderly.........”How exquisite! Sadly, most people nowadays only love knowing that they will receive. Also I think that people give their love to the 'wrong' people so to speak. Like myself, loving all the guys I've dated unconditionally and they cheat.. Being a Christian is indeed difficult, but we know it is for a greater purpose. For salvation of souls. Jesus loved us so much till it really physically hurt him on the cross.. Just thinking about this makes me so repentant. Thank you for the post Father. God Bless you abundantly. I echo your writing on "Love is a decision" and "Love when it hurts". Love is not 'touchy-feely'. It is a conscious act and a commitment to continually love that person (especially one's spouse) no matter how difficult and frustrating situations may be and no matter how different we are. Jesus made that decision to love his enemies, to love sinners (us). It is a painful and self-sacrificing decision, that can only be made with God. Reflecting on this, it has also helped me realise that I can only love till it hurts, when that decision to love is made with God. Loving a person will entail making painful and self-sacrificing decisions. This kind of love is humanly impossible. But with God, nothing is impossible.